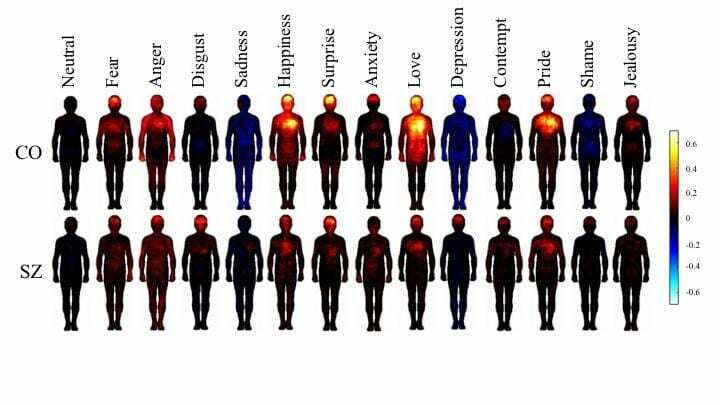 Colorful figures of the human body are helping Vanderbilt University researchers understand how people experience emotion through their bodies and how this process is radically altered in people with schizophrenia. Sohee Park, Gertrude Conaway Vanderbilt Professor of Psychology, and Ph.D. student Lénie J. Torregrossa compared individuals with schizophrenia with matched control participants, asking each to fill in a “body map” in a way that correlates to the way they physically experience emotion. They used a computerized coloring task to locate where participants feel sensations when they experience, for example, anger or depression. The outcomes differed radically between groups, with the control group showing distinct maps of sensations for 13 different emotions, indicating specific patterns of increased arousal and decreased energy across the body for each emotion. However, in individuals with schizophrenia, there was an overall reduction of bodily sensation across all emotions. The study also found that individuals with schizophrenia don’t differentiate on their body maps for varying emotions. That may pose a problem for them in identifying, recognizing and verbalizing their emotions or trying to understand the emotions of others.